For the first time, a book exists that compiles all the information candidates need to apply for their first Woodworkers job, or to apply for a better job. What you'll find especially helpful are the worksheets. It is so much easier to write about a work experience using these outlines. It ensures that the narrative will follow a logical structure and reminds you not to leave out the most important points. With this book, you'll be able to revise your application into a much stronger document, be much better prepared and a step ahead for the next opportunity. The book comes filled with useful cheat sheets. It helps you get your career organized in a tidy, presentable fashion. It also will inspire you to produce some attention-grabbing cover letters that convey your skills persuasively and attractively in your application packets. After studying it, too, you'll be prepared for interviews, or you will be after you conducted the practice sessions where someone sits and asks you potential questions. It makes you think on your feet! 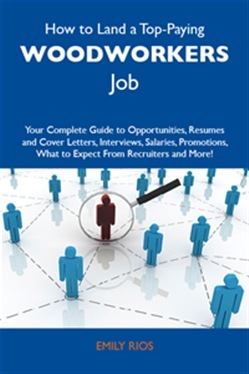 This book makes a world of difference in helping you stay away from vague and long-winded answers and you will be finally able to connect with prospective employers, including the one that will actually hire you. This book successfully challenges conventional job search wisdom and doesn't load you with useful but obvious suggestions ('don't forget to wear a nice suit to your interview,' for example). Instead, it deliberately challenges conventional job search wisdom, and in so doing, offers radical but inspired suggestions for success. Think that 'companies approach hiring with common sense, logic, and good business acumen and consistency?' Think that 'the most qualified candidate gets the job?' Think again! Time and again it is proven that finding a job is a highly subjective business filled with innumerable variables. The triumphant jobseeker is the one who not only recognizes these inconsistencies and but also uses them to his advantage. Not sure how to do this? Don't worry-How to Land a Top-Paying Woodworkers Job guides the way. Highly recommended to any harried Woodworkers jobseeker, whether you want to work for the government or a company. You'll plan on using it again in your efforts to move up in the world for an even better position down the road. This book offers excellent, insightful advice for everyone from entry-level to senior professionals. None of the other such career guides compare with this one. It stands out because it: 1) explains how the people doing the hiring think, so that you can win them over on paper and then in your interview; 2) has an engaging, reader-friendly style; 3) explains every step of the job-hunting process - from little-known ways for finding openings to getting ahead on the job. This book covers everything. Whether you are trying to get your first Woodworkers Job or move up in the system, get this book. Acquista How to Land a Top-Paying Woodworkers Job: Your Complete Guide to Opportunities, Resumes and Cover Letters, Interviews, Salaries, Promotions, What to Expect From Recruiters and More in Epub: dopo aver letto l’ebook How to Land a Top-Paying Woodworkers Job: Your Complete Guide to Opportunities, Resumes and Cover Letters, Interviews, Salaries, Promotions, What to Expect From Recruiters and More di Emily Rios ti invitiamo a lasciarci una Recensione qui sotto: sarà utile agli utenti che non abbiano ancora letto questo libro e che vogliano avere delle opinioni altrui. L’opinione su di un libro è molto soggettiva e per questo leggere eventuali recensioni negative non ci dovrà frenare dall’acquisto, anzi dovrà spingerci ad acquistare il libro in fretta per poter dire la nostra ed eventualmente smentire quanto commentato da altri, contribuendo ad arricchire più possibile i commenti e dare sempre più spunti di confronto al pubblico online.